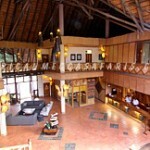 Step into Mowana Safari Lodge and sense the splendours that await you beyond the accommodation’s experience: the mighty Chobe River, wherethe river god will reveal to you the secrets of his watery domain. 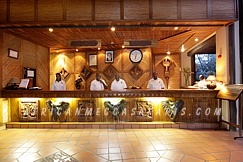 In these tranquil surroundings you will come to experience true comfort, superb accommodation, magnificent Africa buffets and only the best in personalized ‘African-style’ service. Play a round of golf on the famous golf course or enjoy bird watching from the Mokoro – an unforgettable canoe trail on the Chobe. All bedrooms boast spectacular river views and have been tastefully decorated in an ethnic style to complement the natural ambiance. 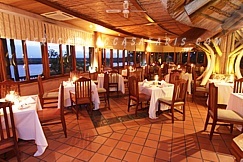 Both the Serondella restaurant and Savuti cocktail Bar overlook the Chobe River and Namibian flood plains, the ultimate place to watch the abundant wildlife gather at twilight. Life doesn’t get much better than this. Long afterwards, when you recall your African dream, you’ll remember where it all began; at Morwana, where the immense and imposing Baobab tree stands at the entrance to Paradise. 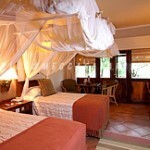 The Chobe Park will delight you with a parade of wildlife, the most fascinating of which are its elephants. Their sheer numbers mean you are practically guranteed to encounter these majestic giants on the river cruise and game drives; you will marvel at how close you will be able to get to them. 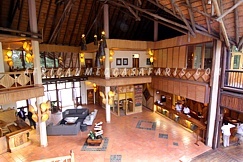 Feel the magic at the point where four countries meet – Botswana, Namibia, Zambia and Zimbabwe – and indulge your senses with a wealth of sights and sounds; the power awesome power of the mighty waters, the soothing silence of the savannah, the harmonies of a hundred birdsongs and more, and the beat of the blazing sun; it all fires the spirit. 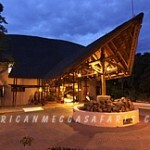 Experience this and know that you have found the African dream at Mowana. 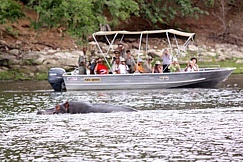 Be transported into the wonders of the African wild as you breakfast on a river cruise, and are greeted by the yawn of a hippo. Be initiated into the ruthless and raw nature of the wild as you are privileged to witness of lions at their kill, and witness hyenas cackling and the vultures screeching as they await their turn. 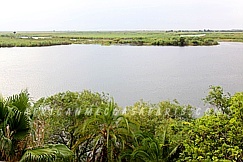 for birdwatchers, we have over 400 different species native to this environment. Hop over the border to Victoria Falls, a mere hour’s drive away, and find out why it was known as the “Smoke That Thunders” before David Livingstone saw it. 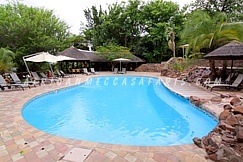 Then shoot the rapids in a whitewater raft, or jump from the bridge on a bungy cord, for one of the world’s highest jumps when you return, cool off in our sparkling pool, with its view over the river, and toast the sunset with our specially mixed exotic fruit juices – or something stronger, if you prefer, from our comprehensively stocked Savuti bar. 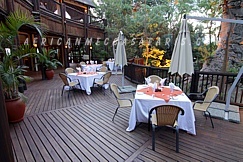 then be ready to savour a wide range of gastronomic delights as our sumptuous buffet in the Serondela resturant, where amongst other dishes, we serve kudu, warthog, impala, wildebeest and crocodile for those with adventurous tastes. 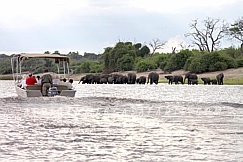 Game drives within the Chobe National Park offer the opportunity to view the abundant elephant and other big game species up close, and also the possibility of an encounter with one of the large predators. 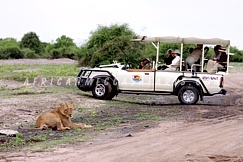 Game drives depart three times a day (approximately 3 hour duration). 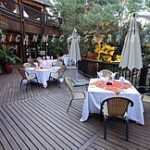 Alternatively there is an option of booking a full or half-day drive with a picnic lunch. 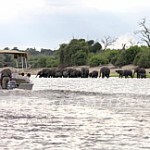 Chobe River cruises have to be one of the finest game viewing experiences in Africa. With over 80 000 elephant in the park alone they are a very frequent sighting. 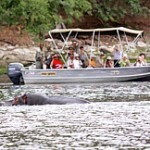 Hippo, water birds, buffalo, crocodile and puku are also viewed from the river. 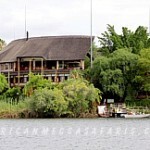 Private cruises, led by our expert guides are available throughout the day to suit your individual needs. 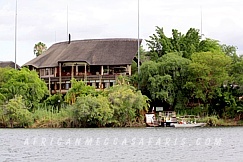 Fishing for the legendary Tigerfish and several species of Bream not only provides an exciting fishing experience, but excellent game viewing (crocodile, hippo, elephant, buffalo) and birding as well. 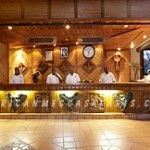 Equipment is provided, and a knowledgeable guide is on hand for all expeditions. 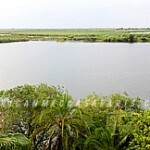 Fishing is done by boat positioned near banks and mid-river rocks. Equipment provided. A knowledgeable guide is on hand for all expeditions. 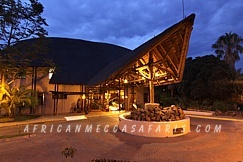 AfricanMecca Safaris also offer full day trips to Victoria Falls – World Heritage Site, a Natural Wonder of the World, the largest curtain of falling water on the planet. 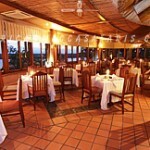 Our guests can choose from a guided option, a day trip including activities or just a simple transfer there and back. 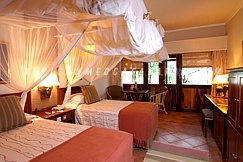 112 luxury air conditioned rooms & 4 suites. 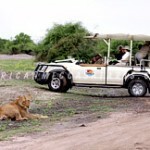 Game drive in Chobe Game Park. 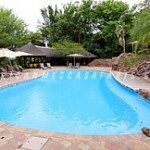 Tennis courts and swimming pool.